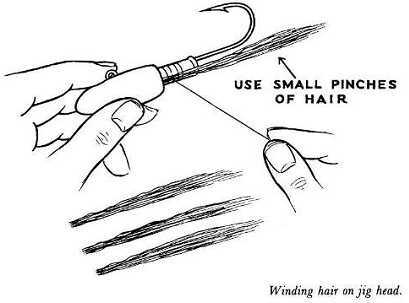 In jig tying the bucktail hair around the jig head, do it in stages. The first step is to get some heavy silk, nylon, or linen thread. You can also use heavy button cord or sewing thread if you want. White is the best color to use unless you want to match the head or hair with an identical color. Cut off about a 2-foot length of this thread, wrap a few turns of the thread around the jig head where the bucktail will go, and cover this wrapping with clear quick-drying cement. Now quickly take a pinch of hair, lay it against the cement, and wrap a few turns of the thread around it. See illustration below. Then add another drop or two of cement, lay another pinch of hair against it, and tie a few more turns of thread around the hair. and lay them on the table to be used as needed. When you have the full amount of bucktail hair wound on the jig head, finish the jig tying by wrapping the rest of the thread as tightly as possible over the jig. Then end it by tying a series of half-hitches. Finally, cover the thread wrapping with a heavy coat of clear quick-drying cement.